There are a great many (around 7500) tomato varieties grown for various purposes. Heirloom tomatoes are becoming increasingly popular, particularly among home gardeners and organic producers, since they tend to produce more interesting and flavorful crops. 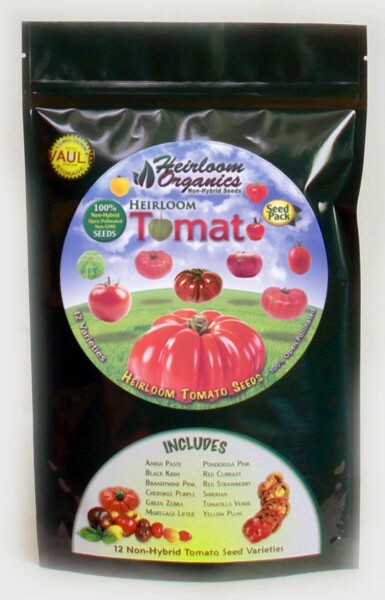 The Heirloom Organics Heirloom Tomato Pack contains many of the most popular Heirloom Varieties available today. You will enjoy the colors and flavors of the old original varieties in your own garden. The Tomato is an herbaceous, usually sprawling plant in the Solanaceae or nightshade family, as are its close cousins potatoes, chili peppers, tobacco, eggplant and the poisonous belladonna. It is a perennial, often grown outdoors in temperate climates as an annual. The tomato is native to South America. The tomato is now grown worldwide for its edible fruits, with thousands of cultivars having been selected with varying fruit types, and for optimum growth in differing growing conditions. Cultivated tomatoes vary in size from tomberries, about 5mm in diameter, through cherry tomatoes, about the same 1–2 centimetres (0.4–0.8 in) size as the wild tomato, up to "beefsteak" tomatoes 10 centimetres (4 in) or more in diameter. First acquired from Amish communities of Pennsylvania, Amish Paste tomatoes are know for their juicy, thick texture and succulent taste. They are an indeterminate variety, and require roughly 3 months from transplant to reach maturity and weights of 8 ounces or more. Amish Paste tomatoes are great eaten fresh in salads, and are also a good choice for sauces and purees. Native to Russia, Black Krims produce beefsteak-type tomatoes that can show unique dark violet coloration when given plenty of sun exposure. They are indeterminate, and typically require 70-90 days to reach maturity after transplant. Black Krim are renowned for their great, mildy-tart taste. Brandywine tomatoes are among the oldest heirloom tomato varieties, and have been grown for well over 100 years. They produce a large, slightly sweet, pink, beefsteak tomato that can weigh 1 1/2 pounds. Time to maturation can be as long as 100 days after tranplanting. Indeterminate growing vines can reach 9 feet in height with plenty of light and heat. Ripens to a green color, with cream/yellow spots and stripes. The flavor is generally considered excellent and this variety often makes top ten lists for its taste. Mortgage Lifter tomatoes were developed by Willam Estler of Barboursville, West Virginia in the 1920s. According to lore, the unique and extraordinary taste of these tomatoes proved to be such a success that Mr. Estler was able to pay off his home mortgage within a few years by selling plants of this variety. The plants are indeterminate growers, and come to maturity 70-85 days after transplanting. Mortgage Lifter tomatoes are known for their sweet, rich flavor and prodigious size, with the beefsteak tomatoes sometimes reaching 2 pounds! Ponderosa tomatoes are flavorful and meaty-and are a great choice for those looking for a tomato with low acidity. The large, pink beefsteak tomatoes typically need about 95 days to mature after transplanting. Vines are indeterminate growers. Red Currant plants produce copious quantities of small (~1/2" diameter), deep red tomatoes that are exceptionally sweet and packed with flavor. They typically require around 75 days to reach maturity, and make a good choice for containers and hanging baskets, though they are indeterminate growers. Strawberry tomatoes are native to Germany, and typically reach weights between 10-16 ounces. It requires around 80 days for the red, strawberry shaped fruits to reach maturity. Plants are indeterminate growers. Strawberry tomatoes are especially well-suited as slicers, and make an ideal addition to sandwiches and salads. Siberian tomatoes are unique in their tolerance of cool conditions, relative to other tomatoes. The can be successfully germinated at slightly lower temperatures than other varieties that typically need a starting medium temp of 75 degrees F or higher. Additionally, Siberian tomatoes can be grown in a shorter growing season, typically requiring 60-70 days after transplanting. The small, round tomatoes are versatile, and are especially well-suited for sauces, juices, and pastes. Siberian tomato plants are determinate growers, typically reaching 6-8' feet tall.